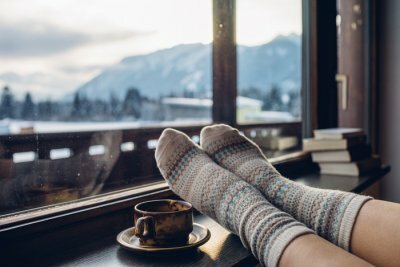 Whether you want to escape from the hustle and bustle of city life or want to relax in a sleepy corner, there are so many best hotels in Singapore that will let you spend a peaceful and luxurious holiday. From the lavishing infinity pool overlooking the Singapore skyline to the class-apart in-house restaurant, there’s so much in these luxurious hotel that will instantly make you fall in love with them. 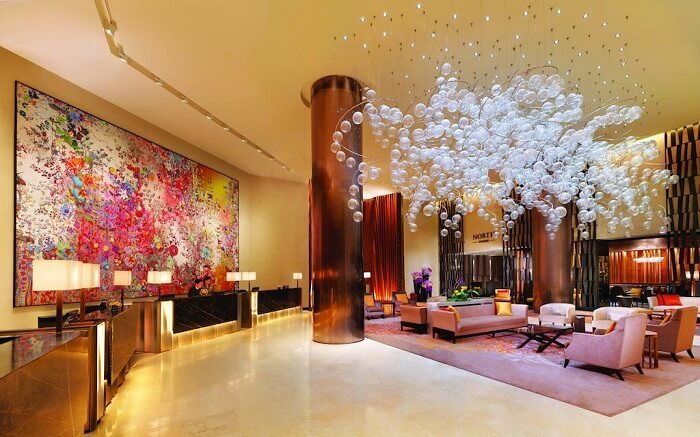 Here’s our list of luxurious to budget hotels in Singapore, for every kind of traveler. Overlooking the Marina Bay Sand—one of the finest Singapore tourist attractions, Fullerton Bay is a top-rated hotel in Singapore. 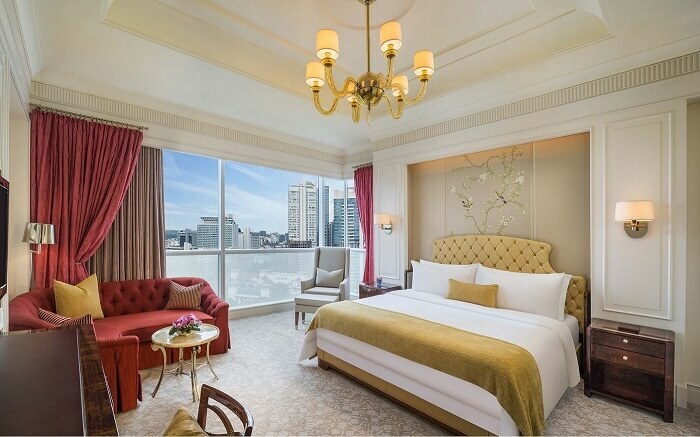 100 well-designed rooms and suites featuring all modern amenities, pillow menu with 9 choices, private jacuzzi, and world-class dining options have helped Fullerton Bay to bag a few prestigious awards and recognition. 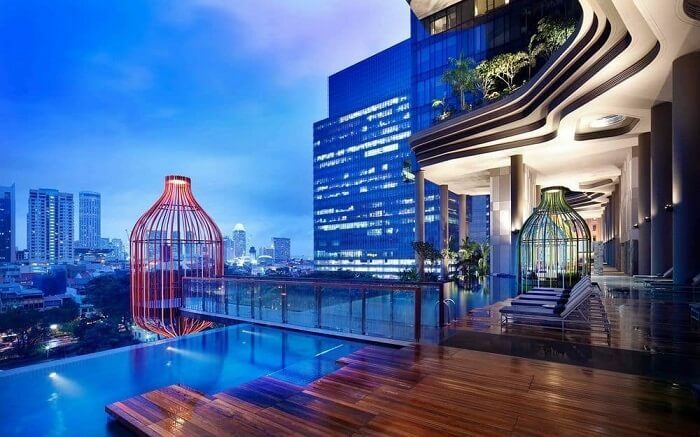 Given ‘Forbes Travel Award’, ‘Top 1 Percent Hotels in Singapore’ by TripAdvisor, and Destin Asian’s Reader’s Choice Awards, this hotel has become among the best hotels in Singapore. The in-house spa has also earned World Luxury Spa Award in 2017. What’s special: Lantern Bar- the rooftop restaurant with an infinity pool. 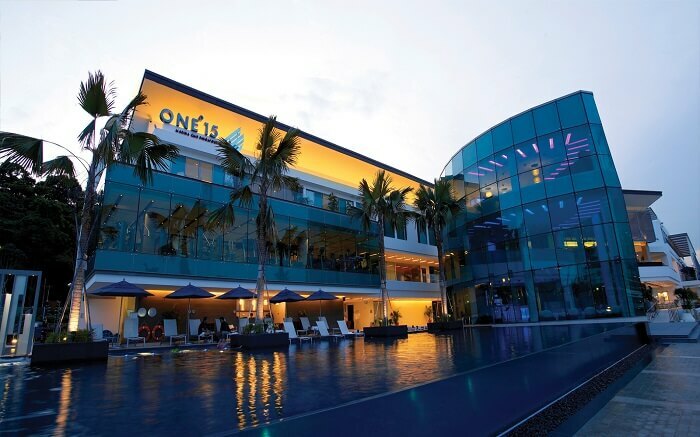 One can enjoy various theme parties like Rose Garden Party, The Botanist and Bubbles and Heels Ladies’ Night or enjoy laser shows of Marina Bay from there. 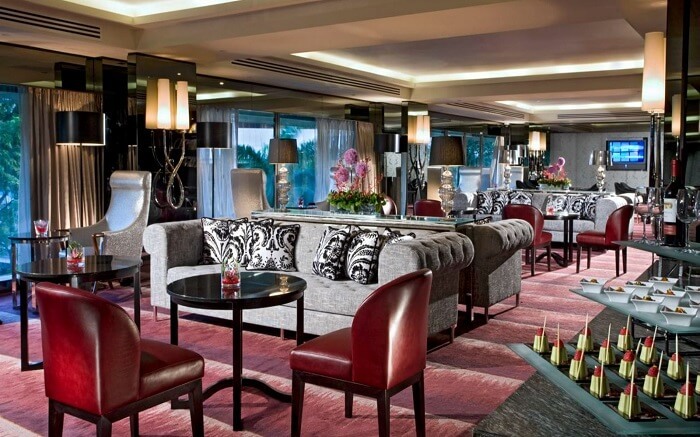 Counted as one of the most reputable 5-star hotels in Singapore, Fairmont is known for its comfort and style. With 769 lavish rooms, suites, 15 restaurants, and cafes within the hotel, the guests are not only offered luxurious living here, but also incredible services and facilities to indulge in. From limousine service and babysitting service to outdoor tennis courts and whirlpools, the hotel has everything to make your holiday super relaxing. What’s special: Willow Stream Spa with couple suites and private jacuzzi. Must visit tourist attractions: Singapore Art Museum, Mint Museum of Toys, St. Joseph’s Church and Cat Museum. 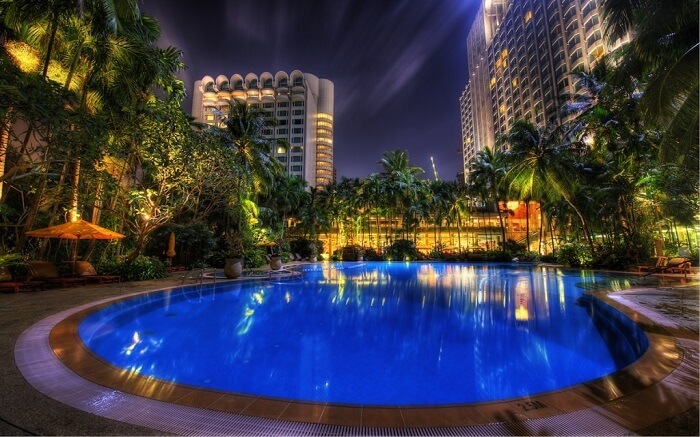 Shangri la is one of the top Singapore hotels, located near the most buzzing shopping areas of the city; Orchard Road. The hotel is divided into Tower Wing, Garden Wing and Valley Wing and offers well-appointed guest rooms and suites in all three. Among all the fine dining restaurants, do not miss Lobby Lounge which offers authentic traditional hawker fare in an indoor garden set up. What’s special: Hotel’s orchid garden, renowned as ‘Singapore’s second botanic garden”. Recommended room: Premier Balcony Suites in the Garden Wing with outdoor jacuzzi, sun loungers and private barbeque grill. 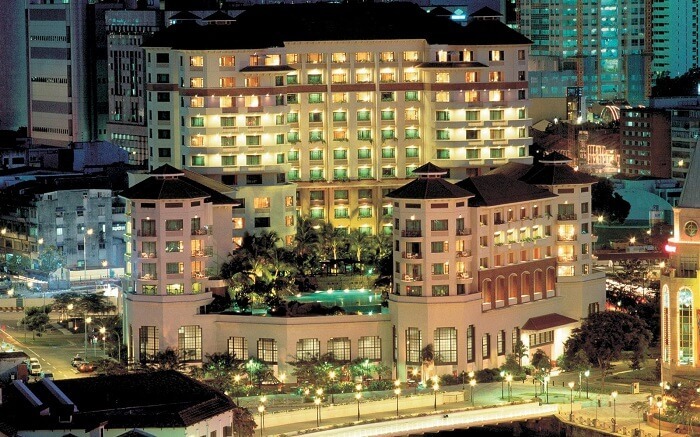 Hilton is one of best hotels in Singapore in luxury category. The hotel is a proud winner of ‘Hall of Fame’ by TripAdvisor for consecutive 5 years. The rooftop pool of the hotel is amazing and the 6 dining options, including one award winning Italian restaurant never fails to make guests feel delightful. 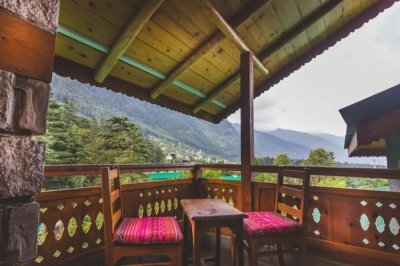 Along with stylish décor, personalised services, and contemporary amenities, the most appealing factor here is the location. Nestled right at the heart of Orchard Road, Shangri La is surrounded by large and posh shops, boutiques, eateries; this location is heaven for those planning for some shopping in Singapore. What’s special: 2 storied luxury boutique store within the hotel. Must visit tourist attractions: National Museum of Singapore, Istana, Emerald Hill Road, Singapore Art Museum, Orchard Shopping Mall and Takashimaya Shopping centre. Witness supreme luxury and indulgence at Pan Pacific, offering top-class stay experience in Singapore. Be it epicurean delights, modern rooms, jaw-dropping view of Marina Bay or well-appointed health club and fitness centres, Pan Pacific is unparalleled in all aspects. Be it complementary use of handy phone or availability of Meiko Tailor for bespoke tailoring, there is something wonderful for every guest, which makes it one of the top hotels in Singapore. For those looking for reinvigoration and comfort, book Swissotel Merchant Court without a second thought. The rooms and suites are luxurious, comfortable and offers cutting edge amenities like Nespresso machine, handy smartphone, complimentary lounge access and pillow menu. In-house dining options are excellent and the hotel offers excellent city guide and local shopping guide, which makes it one of the best hotels in Singapore city. 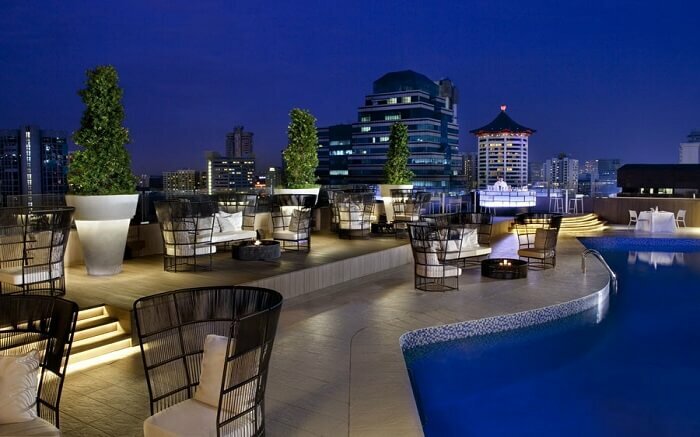 What’s special: Loacted right next to Clark Quay, this hotel is encircled with buzzing pubs, night clubs, eateries and cafes and one can enjoy sizzling Singapore nightlife, by staying here. Must visit tourist attractions: Clark Quay, Riverside Point, Fort Canning Park and Singapore River. and numerous pubs, and night clubs like The Pump Room and Attica. Many popular spas are also located near the hotel such as Amrita’s wellness and Ikeda Spa. 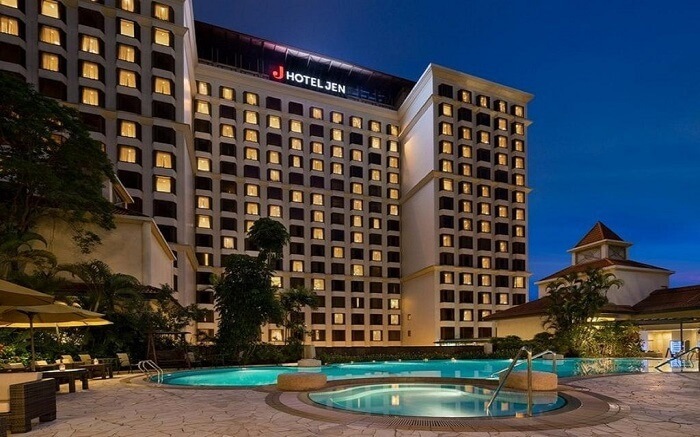 Hotel Jen Tanglin Singapore is in sync with comfort, convenience, and up to the mark facilities. The hotel offers club lounge amenities, free internet access, and international calls on one hand and relaxing swimming pool, lush green garden, and round the clock access to gym & fitness centre on the other. All these facilities together have made Hotel Jen Tanglin Singapore among the best business and leisure 4 star hotels in Singapore. What’s special: Complimentary shuttle services to different parts of the city. Must visit tourist attractions: Singapore Botanic Garden, Tanglin Mall Bazaar, Museum of Art and Design, Takashimaya and Orchard Road. At the heart of Central Business District of Singapore, this is one of the most popular business hotels and resorts in Singapore. 392 well-appointed rooms, spacious banquet, authentic Chinese restaurants, Futsal court and Balinese swimming pool continues to overwhelm guests throughout the year. 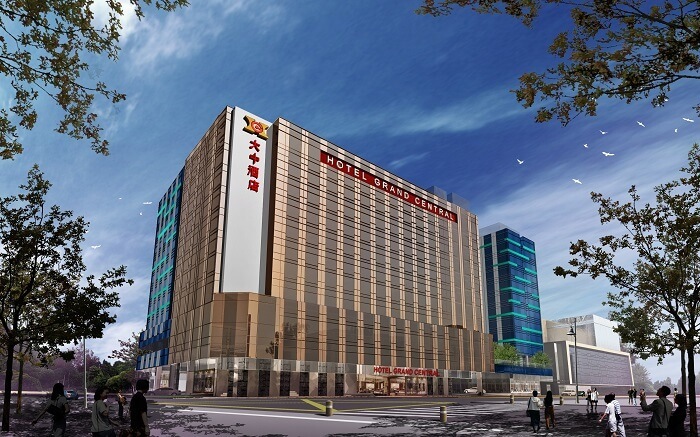 What’s special: The hotel is located next to a shopping mall- 100 AM. Must visit tourist attractions: Universal Studios, China Town, Seng Wong Beo Temple and Singapore City Gallery. 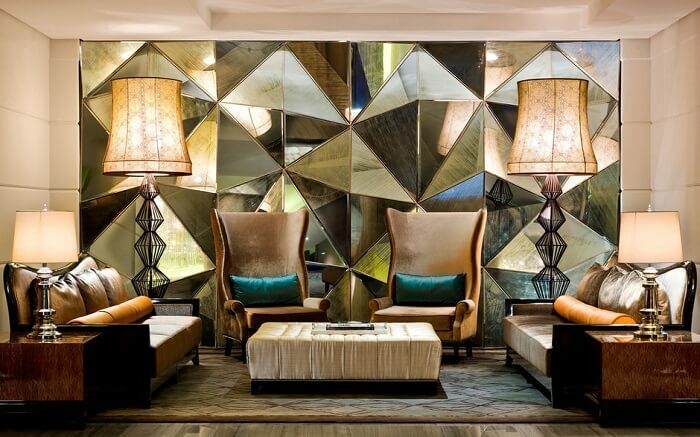 Super cool décor, personalised services, and unending recreation options welcome you at Hard Rock Hotel. 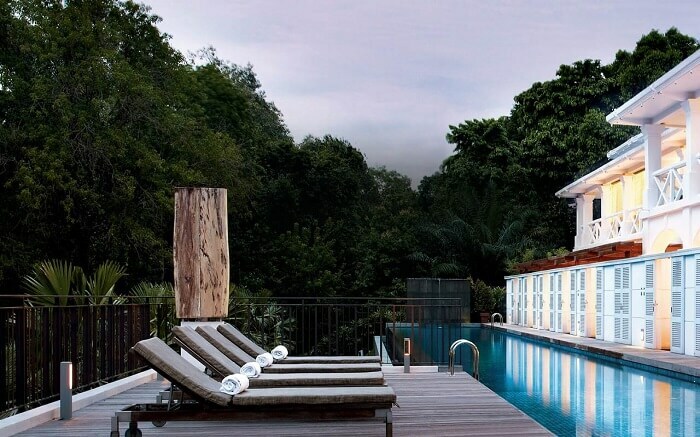 All the rooms and suites are non-smoking and the poolside bar, sandy pool for the kids, beach volleyball court and poolside cabanas make it one of the best hotels in Singapore. What’s special: On arrival, the hotel provides complimentary Sentosa Express Pass for hassle-free commute to Sentosa Underwater World. Recommended room: Rock Star Suite. The first round of mini bar menu of Rock star suite is on the house. Yes- you heard it right! Must visit tourist attractions: Sea Aquarium, Dolphin Island, Trick Eye Museum, Universal Studio, Singapore Cable Car, Madame Tussauds and Tiger Sky Tower. Considered as one of the best 4 star hotels in Singapore, One 15 Marina Club offers breath-taking ocean and hill views, spacious rooms, waterfront restaurants and everything for a mesmerising vacation. Moreover, the hotel also possesses well-appointed boats and yachts to experience luxury living amidst azure blue sea. What’s special: Lavish bathrooms with sunken bathtub, bath-salts and attached TV. As one of the best hotels in Singapore, Oasia Hotel Novena offers spacious rooms and suites, modern facilities and warm hospitality. Guests enjoy and rejuvenate with open jacuzzi, lap pool and round the clock gym. In one word, this hotel has everything, needed to make a memorable Singapore vacation. 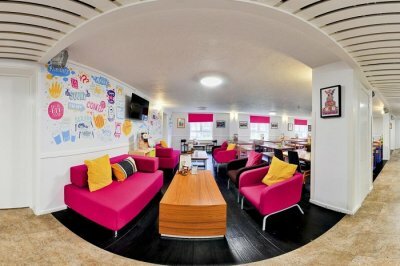 What’s special: The Living Room. A private business centre with private pool and stunning sunset views. Only club room and club suite guests have direct access to the Living Room. If style, elegance, and luxury is on your mind, book Orchard Hotel, which is one of the premier places to stay on Orchard Road. Ranges of accommodation from deluxe rooms to premier suites, Olympic size outdoor pool, huge party area and excellent dining options fascinate people, while a huge well-equipped hospitality room and access to executive club lounge are additional bonus. What’s special: Nothing can be more special here, than the location. 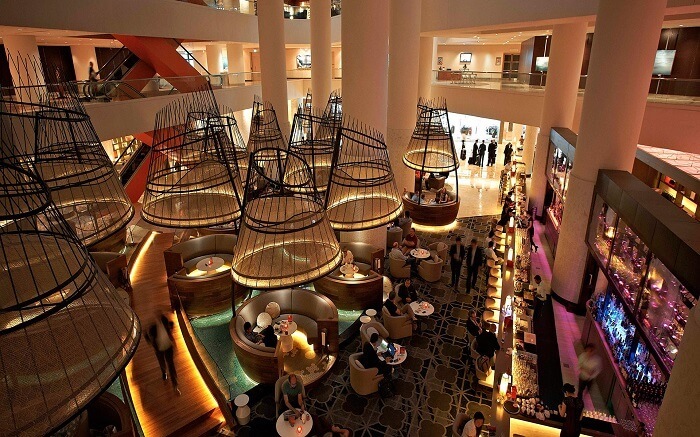 The hotel is located on Orchard Road- the most vibrant and busiest shopping areas of Singapore. 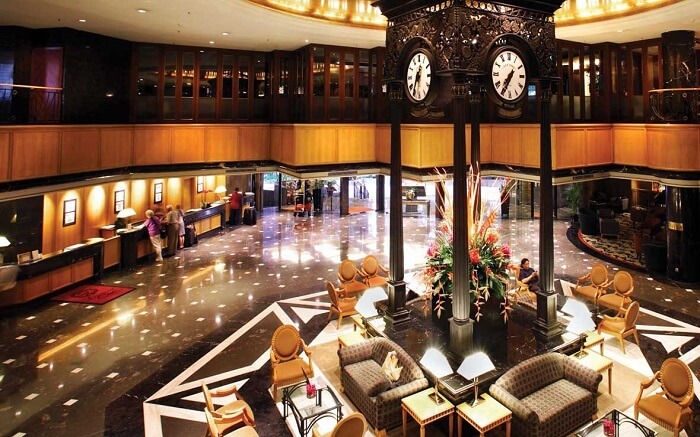 With the most convenient location, Sheraton Towers is among the top hotels in Singapore. This 5 star hotel in Singapore offers best luxuries which include 420 aesthetically designed rooms, outdoor pool at the 5th floor and sauna and steam room. There is an in-house spa to indulge in and the hotel kitchens offering global cuisine is just superb. 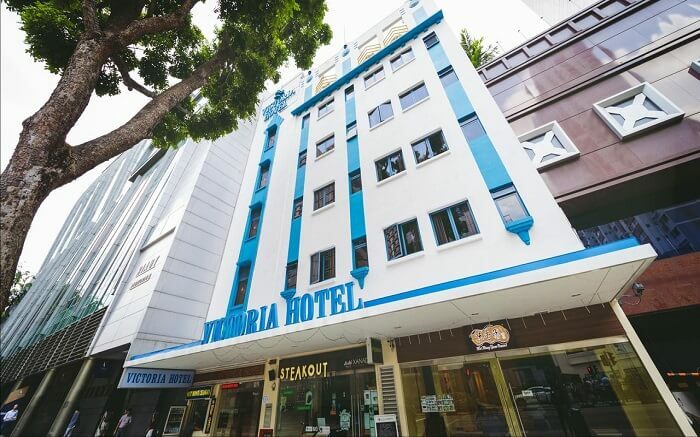 Victoria Hotel is one of the best cheap hotels in Singapore for couples, featuring speedy service, courteous staff and all basic and important facilities. To enjoy a ravishing stay experience; the hotel offers modern rooms, 24 hours front desk, in-house salon and free Wi-Fi in public areas. Don’t miss the sumptuous breakfast offered every morning at Steakout restaurant. What’s special: The hotel houses the world-famous Mei Heong Yuen Dessert restaurant, which has been awarded as ‘CNNGo’s Best Eats Award’ in 2010. 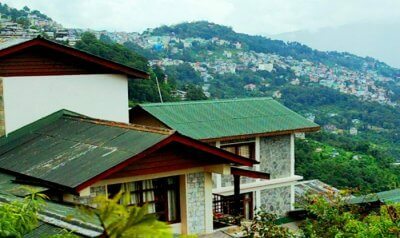 Hotel Grand Central is an idyllic holiday abode, offering best of luxury and comfort at economical rates. Located near Orchard Road, this hotel offers spacious rooms, beautiful terrace and all day casual dining at Sojourn Café. This is among the best budget hotels in Singapore for family stays and long weekends. 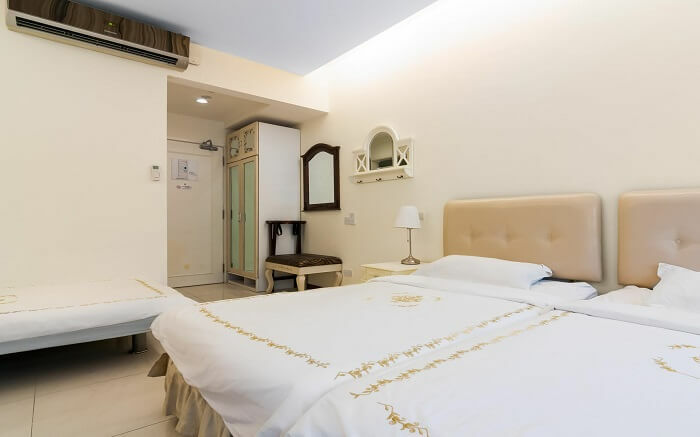 Situated within Little India, hotel Parkroyal is the best hotel to stay in Singapore in low budget. Parkroyal is known for various categories of rooms, 24 hours room service, concierge services and proximity to various shopping centres and malls. 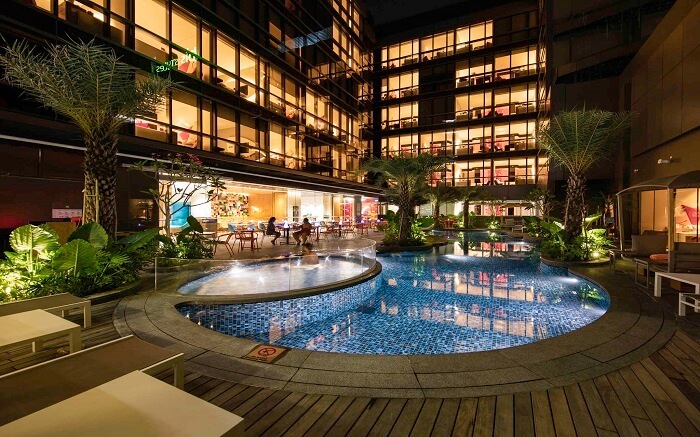 Among the best hotels in Singapore, Village Hotel Bugis is a majestic place to stay in modern rooms and suites, while enjoying the outdoor swimming pool, free Wi-Fi and 24 hours guest services. 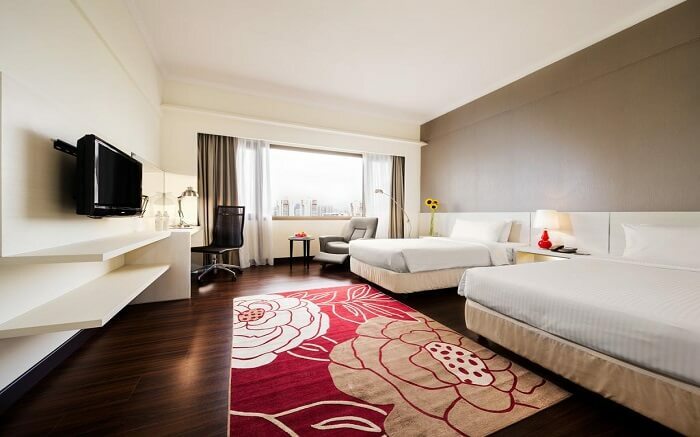 Located near the buzzing shopping areas of Singapore, this hotel offers homely ambience to each and every guest. What’s special: Most convenient location; Just a stone throw from Arab Street, Haji Lane and MRT station. Book your stay at Jayleen 1918 Hotel to experience the perfect amalgamation of traditional and modern living. The hotel building resembles colonial structure and the modern and necessary facilities and services make the guests happy and satisfied. 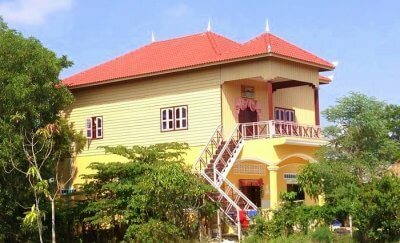 What’s special: The hotel arranges for different sightseeing tours at discounted rates. If you are not looking for fancy décor and ultra-luxurious facilities, but relaxed and hassle-free stay, here is Ibis Hotel for you. 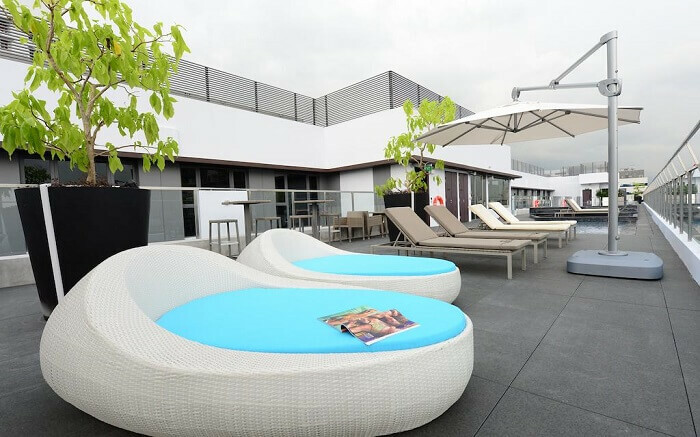 Featuring a bar, restaurant, spacious rooms and meeting rooms and unlimited free wifi Ibis hotel is surely one of the most sought-after names of budget hotels in Singapore. 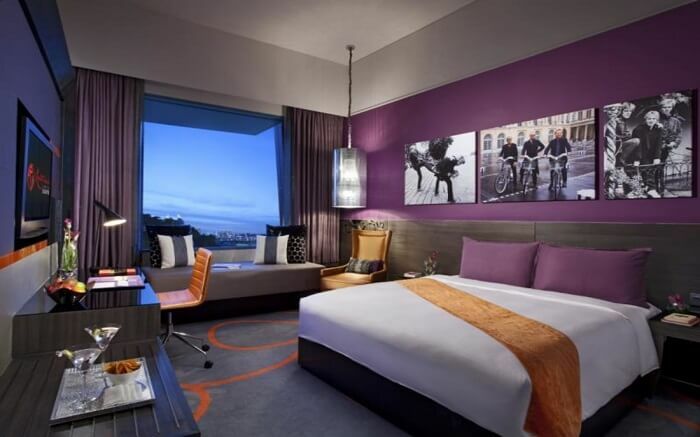 Nestled at the Bugis shopping district, Ibis- a part of the prestigious Accor Group, is known for decent hospitality, helpful staff and modern facilities at a reasonable budget. What’s special: For awesome local food, walk upto Albert Complex Hawker Centre which is at a stone throw distance from Ibis. Parc Sovereign aims at offering sophisticated and immensely comfortable stay experiences to all. 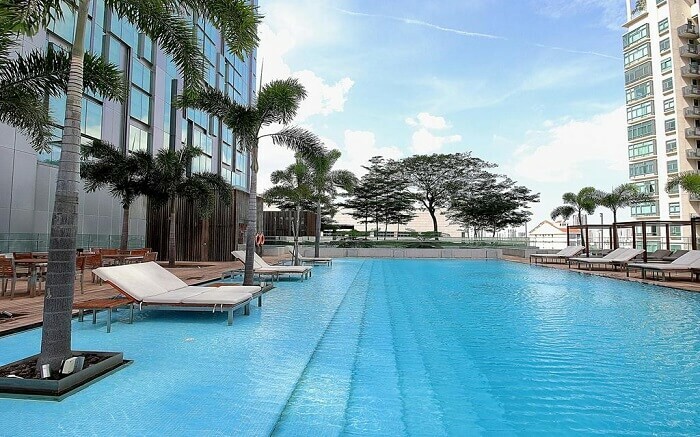 One can enjoy a refreshing day at this decent Singapore hotel by relaxing at any of the 270 well-furnished rooms, checking out various delicacies at in-house kitchen and unwinding at the open-air swimming pool. What’s special: A huge food court just opposite to the hotel for wide varieties of dining options. 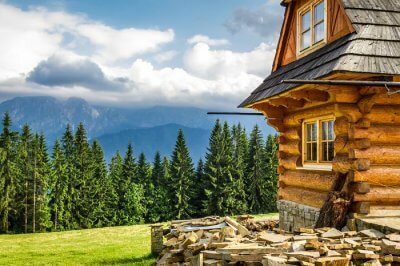 We hope this extensive list of best hotels in Singapore help you find a perfect and cozy abode to spend a memorable holiday with family and friends. If you do not want to get into the trouble of finding a stay, book a Singapore tour package for a hassle-free vacation.